I can visit your school, or you can have a character named for you in my next book!!!!! This auction has now closed. Thanks so much to everyone who took part! I'm taking part in the Authors for the Philippines auction, raising funds for the typhoon Haiyan appeal. There is an AWESOME array of things to bid for - from character names, signed books, school visits, things for writers (like editor/agent critiques, mentoring, and more). 1. You can have a character named for you in my next book! Open internationally. Details here. 2. I can visit YOUR school! this one is open to UK mainland only. Details are here. Auction opens 8 a.m. 13 Nov GMT and closes 9 pm 20 Nov GMT. Come on...it's a great cause. And if no one bids I'll feel very, very unpopular. All the details on how the auction works are on the website; you bid in comments, and if successful pay directly to the red cross typhoon Haiyan appeal. 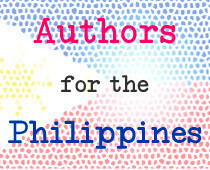 Hi Shajia, you have to bid on the Authors for the Philippines website, as linked above. Thanks! Sorry, this one is over now!